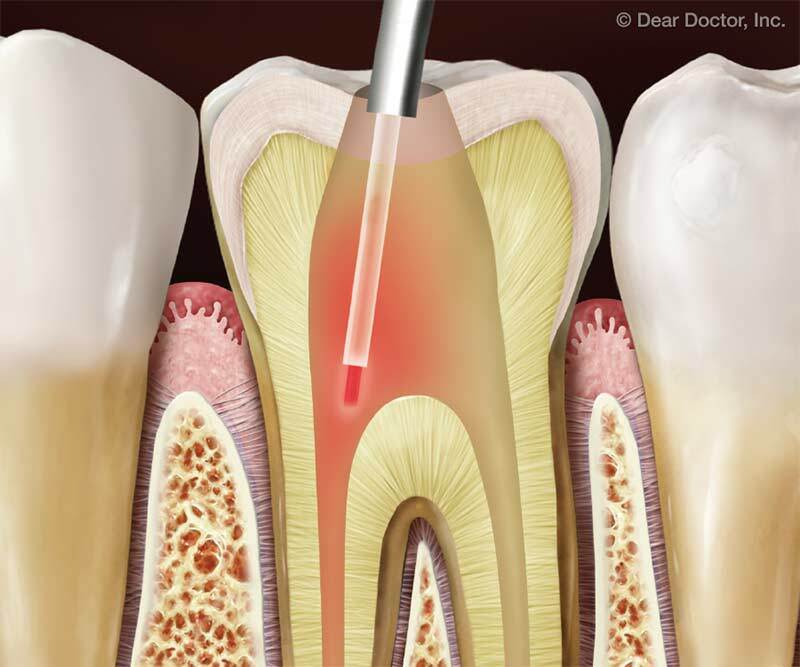 Does Laser-assisted root canal therapy offer any benefits over traditional treatment? Your question is an important one in today's world as lasers are supplementing or even replacing drills and other traditional tools for some dental procedures, including root canals. According to the American Association of Endodontists (AAE), millions of teeth are treated and more importantly saved every year with root canal treatment, which becomes necessary when the dental pulp, the living tissue deep inside the tooth, becomes inflamed and/or infected. Let's see how lasers can be of assistance in root canal procedures. Light Amplification by Stimulated Emission of Radiation (LASER) therapy utilizes light beams to remove or modify soft and hard tissues in the mouth. The Food and Drug Administration (FDA) has approved the use of various lasers as an adjunct in root canal procedures. Lasers essentially emit intense focused light energy, the particular properties of which can interact with biologic tissues. Lasers can now be used to open the surface of a tooth to access the root canal, remove diseased tissue, clean, disinfect and shape the canal, and fill it. At this point it is useful to be familiar with the basic anatomy of a tooth. The crown, or outer surface of the visible part of the tooth, is made up of enamel; beneath this is a second layer made of dentin, a hard bone-like material that also comprises the tooth root or roots. Within the dentin lies the pulp, which contains blood vessels, nerves and connective tissue. Root Canal Treatment (RCT), or endodontic treatment ("endo" – inside; "dont" – tooth) is used to treat a tooth and alleviate the pain that is associated with damage to the pulp. During a traditional root canal procedure, your dentist or endodontist (root canal specialist) will use local anesthesia to numb the tooth. A small opening is made by drilling into the back of a front tooth, or the biting surface of a back tooth, to access the pulp. The inflamed or infected pulp is removed and the root canal system, inside of the tooth, is cleaned, shaped and disinfected. It is then filled and sealed with a rubber-like material called gutta-percha. Finally the tooth is restored with a filling or crown and a successful procedure ensures that a tooth continues in normal function. Lasers can target bacteria and infected material with greater accuracy, at times preserving more of the healthy tooth structure. They can also reduce discomfort by eliminating the jarring sounds of drills as well as limiting the need for local anesthesia. There are reports of less bleeding during root canal surgical procedures and reduced post-operative discomfort and infection. One disadvantage is that laser light travels in a straight line while root canal spaces are rarely straight and traditional instruments offer an advantage since they can be curved to follow the shape of the tooth root. Also, the interactions involved between laser energy and the tooth tissues may cause a rise in temperature, which can damage the canal space and at times even extend to the outer surfaces of the tooth. A recent scientific study comparing the efficacy of laser-activated irrigation of root canals with conventional irrigation to disinfect them found favorable results for the laser technology. Laser-activated irrigation for eradicating bacteria and preventing new bacterial growth was more effective than conventional irrigation delivered via a syringe. While a body of evidence exists on the antibacterial efficacy of high-power laser treatment, the evidence is inconclusive as to whether lasers provide a superior seal or higher clinical success rates than conventional techniques. More research is needed to establish laser-assisted root canal treatment as a preferred technique, especially considering the high success rate of non-laser procedures. Meanwhile, some dentists are combining both the laser and traditional techniques for optimal effects. Talk to your dentist or endodontist about laser-assisted root canal therapy to help weigh the pros and cons to suit your individual needs.